In his debut novel, Chuck Palahniuk showed himself to be his generation's most visionary satirist. 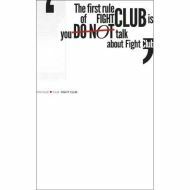 Fight Club's estranged narrator leaves his lackluster job when he comes under the thrall of Tyler Durden, an enigmatic young man who holds secret boxing matches in the basement of bars. There two men fight "as long as they have to." A gloriously original work that exposes what is at the core of our modern world.